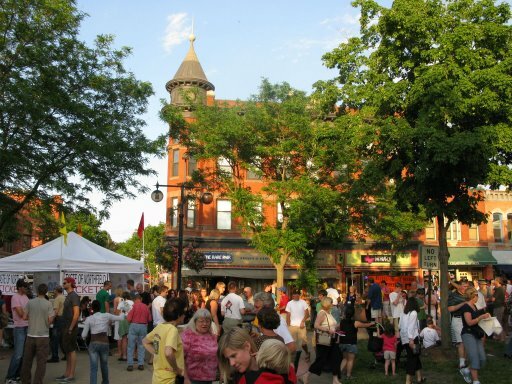 The Northfield Downtown Development Corporation (NDDC) will hold its Fourth Annual Taste of Northfield, Thursday, June 18, featuring a wide range of good eats, entertainment, and fun activities from 5 to 10 p.m., in and around historic Bridge Square, right in the heart of beautiful downtown Northfield. Always one of Northfield’s most popular events, this year’s “Taste” promises to be even bigger and better than ever. Along with a record number of local food vendors and restaurant participants, there will be a concert by Northfield’s Community Band (6-7 p.m.), a special bank raid re-enactment by the infamous James-Younger Gang (7 p.m.), live and silent auctions offering an exciting variety of goods and services, face painting and balloon animals for the kids, and a street dance from 8-10 p.m. featuring the popular Over and Band. Throughout the evening, participants can partake of a delectable selection of tasty treats offered by over two dozen local food vendors, all at special prices, along with a beer garden and wine tasting in a tent set up on the Fourth Street Bridge, overlooking the falls of the Cannon River. The silent auction, held from 5-7:30 p.m., will be followed by a live auction at 7:30 p.m. Mayor Mary Rossing will auction off round-trip airline tickets, a ride in an open cockpit bi-plane, a private porch dinner for twelve on the Chapati porch, a personally-selected case of fine wines, golf tee times, reserved seating for ten at a 2009 Defeat of Jesse James Days bank raid re-enactment, a private party at the Upstairs Rueb, and much, much more! The Fourth Annual Taste of Northfield will definitely offer something for everyone to enjoy. So come on down(town) and join your friends and neighbors for an evening filled with some of the best that Northfield has to offer—great music, delicious food and beverages, and fun for the whole family. The NDDC is a non-partisan, non-profit community organization dedicated to the vitality of downtown Northfield. For more information, contact executive director Ross Currier at (507) 663-0319 or rcurrier@nddc.org. Oops…my apologies to Mr. Griff Wigley for not crediting him for the wonderful photograph used to illustrate this post.